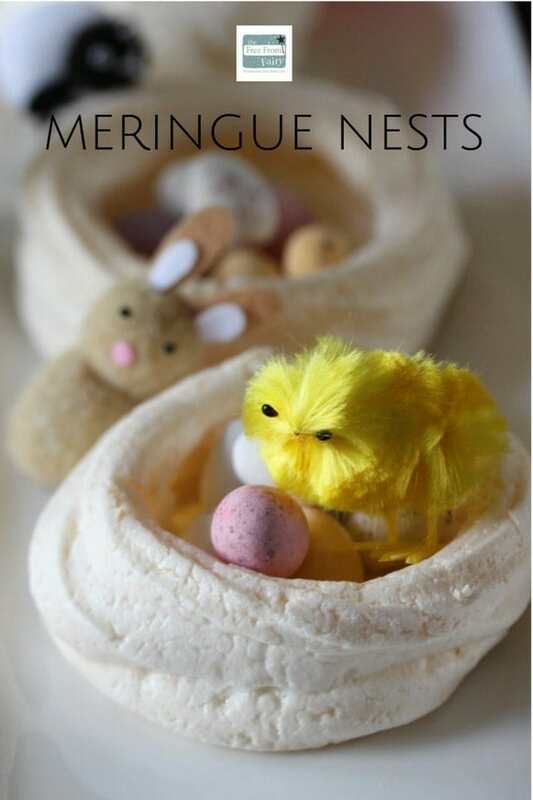 Meringue Nests - An Easter Treat | The Free From Fairy. 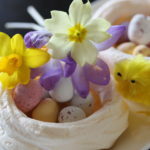 These meringue nests are a beautiful way to use up left over egg whites if you’ve made my Easter biscuits. You can make them any time of year and fill them your way. 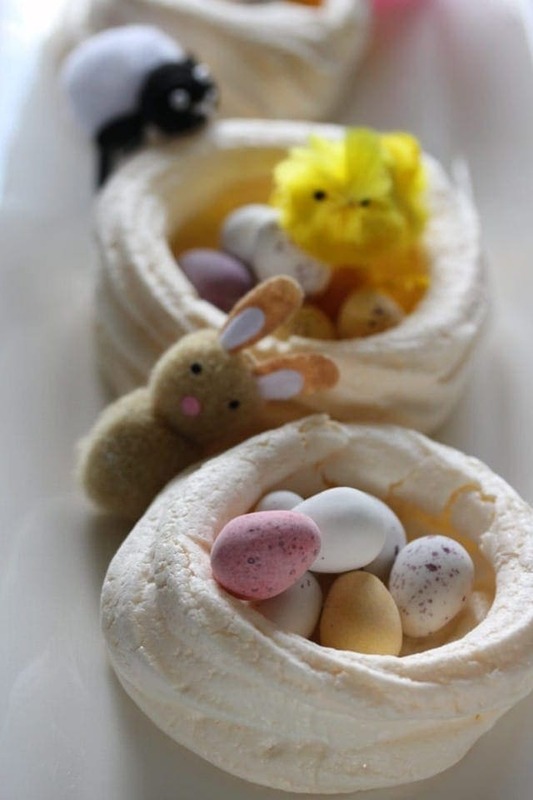 You could even make mini pavlova’s with them. I don’t know about you but I often find myself with leftover egg whites. Recipes often call for egg yolks leaving the poor whites redundant. Being a hater of waste I like to find ways to use up leftover ingredients. Especially if I create a recipe that adds to this issue. 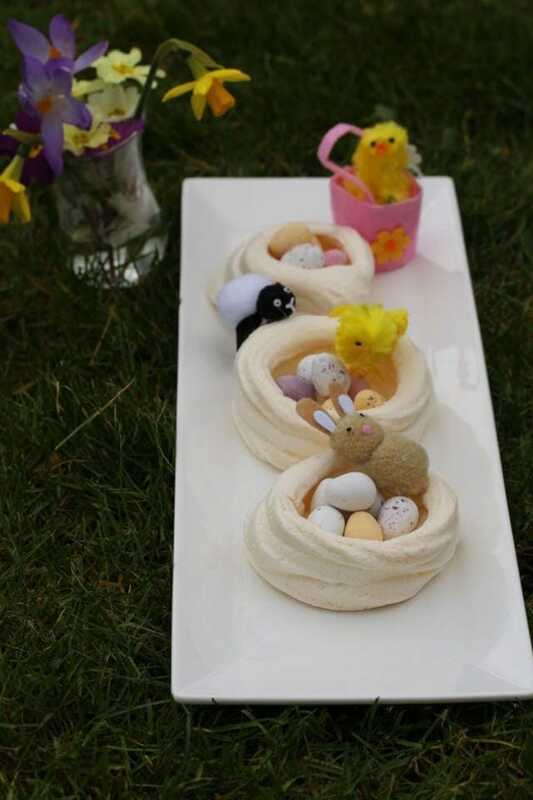 I therefore make these meringue nests when I make these Easter biscuits. That way you get two delicious treats to enjoy at Easter and no waste. If you’re vegan, or can’t eat eggs then you could make these wholesome Easter biscuits. The recipe doesn’t include eggs or refined sugar but the result is a delicious light biscuit that everyone can enjoy. Alternatively try out my Hot Cross Bun Bliss Balls. ‘Roo’ had a great time taking the photographs for this post. I don’t think it will be long before I’ll be handing the blogging over to her. She does most of the ‘sweet’ cooking in this house nowadays. Firstly, don’t be scared. Meringues sound difficult but in reality they aren’t at all. After all they are only egg white and sugar. What can be scary about that? The key to successful meringue making is to slowly whisk the egg whites until they are thick and creamy. And only then to add the sugar, again slowly. I recommend adding 1 tbsp at a time and making sure each is incorporated before adding the next. They must be baked on a low temperature and to prevent major cracks always leave them in the oven to cool. What equipment do you need to make meringues? The easiest way to make meringue is in a stand mixer. I love my Sage mixer for many reasons. Not least because it has a beater that scrapes the edges as it goes. This means you don’t have to keep stopping to scrape down the sides. It also has a really handy timer on the side allowing you to see exactly how long you have been mixing something for. I use it to make everything including bread, cakes and biscuits. For making meringues it’s perfect. First, whisk the egg whites using the whisk attachment. Then with the machine still mixing, add a tablespoon of sugar at a time until it’s all incorporated. If you try to make meringues by hand it’s hard work. Ideally you need two people, one to whisk (whether it’s with a hand held whisk or electric whisk) and the other to add the sugar. You’ll also need a piping set to make the nests and good quality baking trays. I personally use this reusable liner to prevent the meringues from sticking onto the trays but you could use greaseproof paper. The advantage of these liners is that you can use them again and again and nothing ever sticks to them! 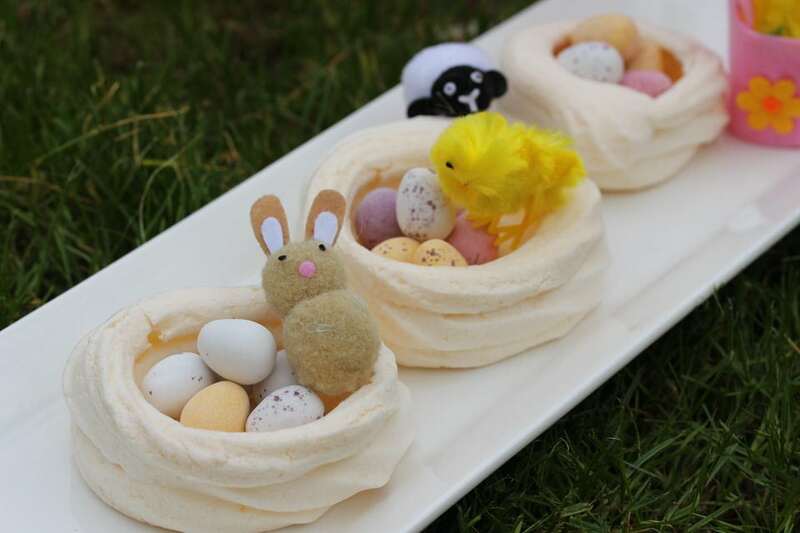 What can you fill meringue nests with? I’ve chosen to fill these nests with mini eggs. They are gluten free but not dairy free. If you needed a dairy free option you could make my vegan chocolate truffles and shape them into eggs. Otherwise whip up some double cream (or the thick part of a tin of coconut milk) and swirl through with some of my healthy lemon curd. If you want a full sugar lemon curd recipe then look no further than here. Alternatively you could make mini pavlova’s by whipping some double cream and adding your selection of fresh fruit. So over to you. 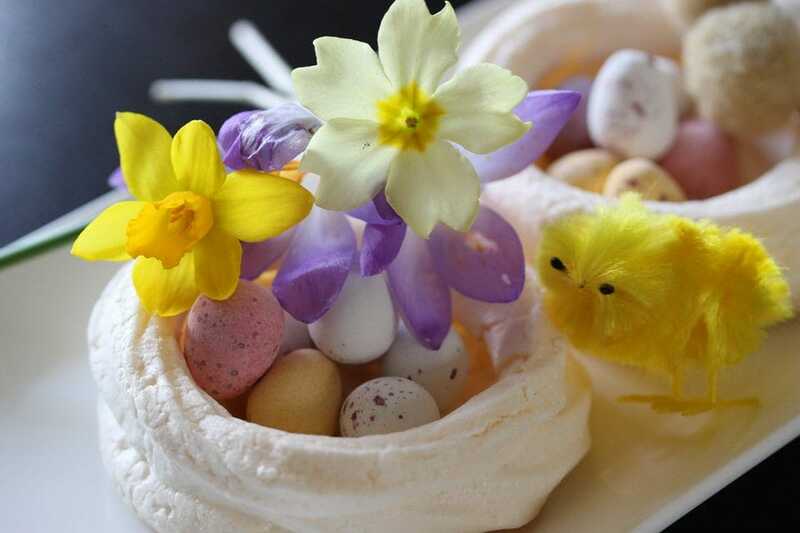 Let me know what you fill your meringue nests with. And if you’re having them for Easter then have a great one. Finally if you like this recipe you might like a copy of my free recipe booklet. It includes recipes for gluten free pastry, bread, scones, pizza, Yorkshire puddings, Victoria sponge, pancakes and gingerbread. Slowly whisk the egg whites on a low speed for two minutes until foamy. After 1 1/4 hours turn the oven off and leave the nests to cool completely in the oven (don't open the door). This will prevent cracking.